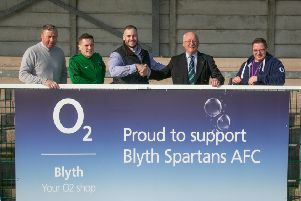 Blyth Spartans manager Tom Wade was pleased with his side’s showing in the home friendly defeat by 2-0 against Blackpool on Tuesday evening. “I thought we were excellent in the first 30 minutes,” he said. “We played some exciting committed football and looked a very strong side. “After the first Blackpool goal our heads went down a little. But overall the first half was just about all we expected to get at this stage of the pre-season. “Making changes in the second half we became disjointed and bit raggy. We lost our shape, but I was still happy with what we did do. “It was a big step up from the Carlisle friendly for the lads, but on Tuesday we were able to work hard across midfield to enable Stephen Turnbull to get the ball and control the match. “New signing Sean Reid did well up front. We will have to be patient with him but I know he will settle and become a very good player for us. “We’re not creating nor taking chances like we did a lot last season, but having lost both Dan Maguire and Jarrett Rivers that’s not all that surprising really. Blackpool manager Neil McDonald said: “It was a brilliant work out for use. Meanwhile Wade is looking forward to the Spartans’ visit to Ashington on Friday night. “It will be a competitive encounter, for sure,” he said.